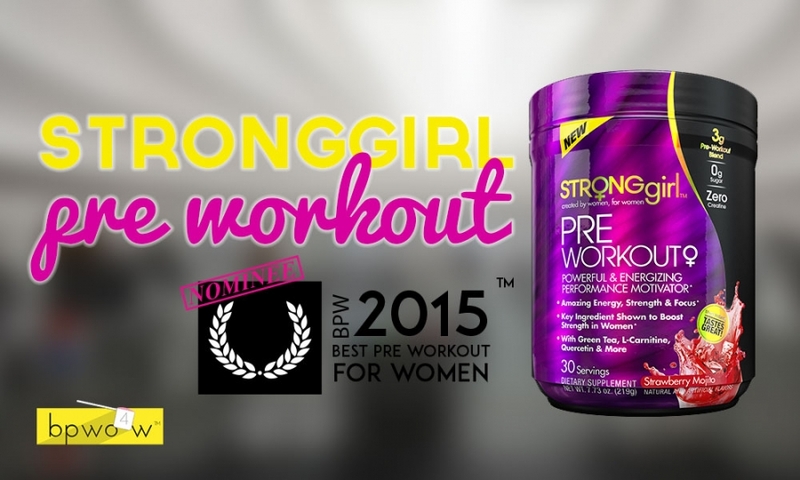 StrongGirl Pre Workout Review: Pretty Face, Does it Work? As you know if you’re a regular reader of the blog- I just recently finished up my overview of StrongGirl’s weight loss supplement Smart Weight Loss. You can read my Smart Weight Loss review here. If you just want the sparknotes, Smart Weight Loss was a nice surprise for me. I went into my trial run with the product not expecting a whole lot in terms of the effects. But what I found was that the product was really quite effective at toning my lower back and midsection. My shoulders and triceps also benefitted from the fat burning effects as I came out of the three week trial looking much leaner overall. So I was hoping the pre workout would be equally effective. It’s not too often that we get new women’s specific pre workouts anymore. A few years ago, tons of companies started cranking out products for women only, but as of late, it seems that the women have gotten to a point where they realize that there isn’t a true need to buy a ‘pre workout for women’ just because it has pink coloring on the package and a girly name. Point of fact is that women actually can take ‘men’s’ pre workouts because men’s pre workouts are very rarely containing ingredients that would support the male body and not women. That being said, some pre workouts do actually contain testosterone boosting ingredients that I think we are best staying away from. The other thing that almost all pre workouts have is creatine, which is not something you want all the time. Don’t get me wrong I love the strong feeling you get from taking this supplement, but the fact of the matter is that you will add some water weight and adapt a slightly ‘fuller’ look when you take creatine. I don’t freak out about this, because it’s very slight. But still who wants to go out feeling like they look like they’re five pounds heavier than they are? Not me. Luckily StrongGirl pre workout does not have creatine. So what does it have? Let’s do things a little differently today and talk about the ingredients first. Beta alanine: This compound works by elevating muscle carnosine levels, which in turn help replenish ATP faster. Beta alanine will cause some tingling in your face and neck, but that is normal and safe. Taurine: This amino acid supports adrenal function and can assist with energy and focus. Green Tea Extract: Green Tea provides natural caffeine, and has a slew of antioxidant properties that support nearly every bodily function. L-Carnitine L-Tartarate: LCLT is a form of carnitine that is highly bioavailable. Carnitine helps with metabolism and muscle growth. It’s a fantastic ingredient. Caffeine: Needs no explanation really. Quercetin: This ingredient does nothing really. Choline Bitartrate: Choline helps energy and focus by making the brain function more efficiently. Rhodiola: An adaptogen that assists with energy production and can help you focus more clearly. L-Theanine: This is an amino acid that provides a calming effect. It is often paired with caffeine to balance out and remove the jittery effect. So to evaluate this ingredient panel. I see a lot of energy and focus ingredients. Some fat loss with the carnitine and and green tea. Basically this looks a lot to me like a powdered fat burning supplement. In fact if I was formulating a weight loss powder it would look a lot like this, minus the beta alanine. Overall I don’t think this would be a bad formula for a cardio workout, so that’s what I’m going to use it for. But first, how does it taste? Wow. That’s what I can say about this flavor. I tried the Strawberry Mojito flavor of Stronggirl pre workout and quite frankly I was blown away. First of all this is just a fantastic idea for a flavor. I don’t even think I’ve ever had a strawberry mojito in real life, so the fact that they came up with this is terrific. We’re so used to the same old same old flavors such as fruit punch or blue raspberry or pink lemonade or something boring and bland like that. But not with StrogGirl. Strawberry Mojito starts with a very very strawberry-y taste. Bam. Berry. It hits you right away, and then as the taste develops in your mouth you can start to pick up notes of lime and mint. It’s really a fun taste and I enjoyed every last sip before heading to the gym for my running workout. I did try this flavor again yesterday and while it was still really good- it was not quite the same as the first time. I realized that you really should have this flavor with the coldest water possible. I think it’s because if you have a real mojito its with the crushed up ice so it’s always ice cold. So having the strawberry mojito flavor with ice cold water helps the flavor authenticity, if you will. Alright. Let’s talk performance! Hm. After raving about the flavor, and seeing how the ingredients aren’t that bad at all, you’re probably as weirded out by the rather bland performance as I am. Let me tell you how it actually worked for me and then I’ll tell you my theory on why I think it wasn’t quite as good as we thought it would be. Like I said, I took StrongGirl pre workout before a super basic cardio workout. I set the treadmill to a 5 incline, and then set the speed up to about 8. I hop on and run for a minute and a half on, and then 30 seconds off. After ten minutes I stay on for 2.5 minutes on, and then take the 30 seconds off. When the 20 minutes is over you end up having run about 2.67 miles, and sweating like a pig. I felt this pre workout help me out through the first portion of the run, particularly with the energy that it provided. But to my dismay the effects really disappeared about halfway through. And this is a workout I’ve done time and time again. It’s not like this was some crazy new rigorous workout and my dip in energy was to be expected. No. With my usual pre workout, I absolutely power through this run. Not so much the case with the StrongGirl pre workout. Did I have a little extra energy and focus in the short term? Yeah. But the endurance really was not there. Here’s why: The proprietary blend that houses all the key ingredients is just 3 grams. And the scoop total is just 7 grams. That’s why they recommend taking two scoops. But at two scoops you are only getting 15 scoops per container. We’ll talk about this in the value summary- but the fact of the matter is that this is a puny formula. Half of the scoop is filler (maltodextrin). And even two scoops gets you just 6 grams of active ingredients. As you know if you read my Smart Weight Loss review, you know I’m a huge fan of the job that the StrongGirl packaging designers did. They really knocked it out of the park in my opinion in every aspect of this package design. The color scheme is brilliant. The shade of purple is just beyond words and I personally felt that I got on an emotional level with the packaging. It’s corny, I know. But just look at it. It’s fantastic! The fonts are beautifully chosen and the the layout is smart and legible. If there are two things that StrongGirl got right with this pre workout supplement- it’s the packaging and the taste. You could argue that those are the two most important things in a pre workout, couldn’t you? The formula itself isn’t poorly thought out in terms of the ingredients themselves. Green tea, carnation, beta-alanine. All good things. But there’s just not enough of this stuff in here to make it worth your money. The packaging is drop-dead gorgeous don’t get me wrong. And it tastes orgasmically delicious. But I’ve just got to be honest with you. $50 can get you so much better. Check out our Top Ten for an alternative option.